UDM Downloads > CVTracker GOLD! The CVTracker is a personal network management system for job seekers. It lets you organize a job campaign with metrics, details on who you've dealt with, what contacts you've made, what companies you are researching, document control and a pipeline to provide you with a true sales tool to sell your services to your next employer. A critical tool for any job seeker, employed, in-transition, or just passively looking. It concentrates on individuals who use the number one method of job seeking - personal networking. The CVTracker Gold is a powerful tool to keep track of your campaign as well as built in accountability and computing power to help you assess your next steps. 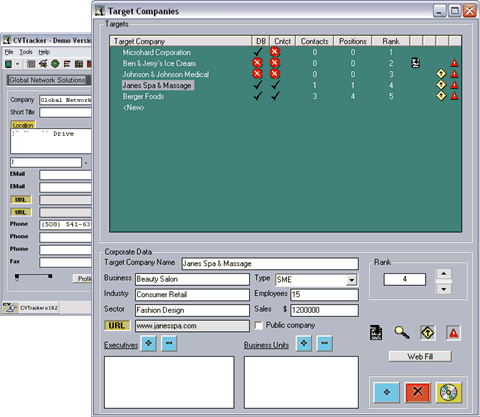 The software contains powerful company targeting tools, and action plan development tools. You have the additional luxury of using the tool with the events management calendar and tasks calendar. Make sure you keep on top of where you've sent your resumes and whom you've contacted in the past. The software also comes with a fast dataparser for easy data entry and a swift search mechanism to sort through your data. Decrease your TTJ (Time-To-Job) indicator with the CVTracker and find your next career step faster and more efficiently.